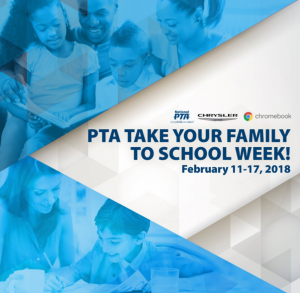 Take Your Family to School Week (Feb. 11-17) is more than just a one-night event, it is a weeklong celebration of family engagement and the great work PTAs have done to support the school community. This year we came up with an easy way for every family to participate in celebrating PTA—Daily themes! Maker Monday: Celebrate the arts in your school community. Showcase the artwork of your 2018 Reflections participants by creating a display in the school entryway. Share pictures of students, teachers and parents enjoying the display using #PTAProud. Try-It Tuesday: Help create healthy eating habits by encouraging families to try a new food or recipe. Pick a fruit or vegetable to be an honored guest! Set-up tasting stations throughout the cafeteria where students can try your featured ingredient prepared in different ways. Share the recipes that you used with your school community. Writer Crush Wednesday: Share your love of reading! Set up an area before or after school for students to read classic love poems and to write their own. There is no better valentine then one that comes directly from the heart! Check out this list for some school appropriate poems. Share an interview with the school technology administrator or robotics coach and ask them what things they wish the greater school community new about the technology opportunities within your school. Even better, set-up an online chat where parents or families can ask the questions live! Family Celebration Friday: Celebrate all the families in your school community! Use this day to take the time to thank everyone for celebrating with us this year! With these themes every PTA member and school can participate in Take Your Family to School Week. We cannot wait to celebrate the founding of National PTA with you all week long! Remember to use #PTAProud to show how you are celebrating Take Your Family to School Week on social media! And, Make sure to share your events with us! Alyssa Montchal is a Programs & Partnerships Program Manager at National PTA.